Prices for net books may be different than what is shown here. From the bestselling author of Band of Brothers and D-Day, the definitive book on Lewis and Clark's exploration of the Louisiana Purchase, the most momentous expedition in American history and one of the great adventure stories of all time. In 1803 President Thomas Jefferson selected his personal secretary, Captain Meriwether Lewis, to lead a voyage up the Missouri River to the Rockies, over the mountains, down the Columbia River to the Pacific Ocean, and back. Lewis and his partner, Captain William Clark, made the first map of the trans-Mississippi West, provided invaluable scientific data on the flora and fauna of the Louisiana Purchase territory, and established the American claim to Oregon, Washington, and Idaho. Ambrose has pieced together previously unknown information about weather, terrain, and medical knowledge at the time to provide a vivid backdrop for the expedition. Lewis is supported by a rich variety of colorful characters, first of all Jefferson himself, whose interest in exploring and acquiring the American West went back thirty years. Next comes Clark, a rugged frontiersman whose love for Lewis matched Jefferson's. There are numerous Indian chiefs, and Sacagawea, the Indian girl who accompanied the expedition, along with the French-Indian hunter Drouillard, the great naturalists of Philadelphia, the French and Spanish fur traders of St. Louis, John Quincy Adams, and many more leading political, scientific, and military figures of the turn of the century. High adventure, high politics, suspense, drama, and diplomacy combine with high romance and personal tragedy to make this outstanding work of scholarship as readable as a novel. "Stephen Ambrose is that rare breed: a historian with true passion for his subject. Here he takes one of the great, but also one of the most superficially considered, stories in American history and breathes fresh life into it. Lewis comes alive as we've never known him." past, clould have written this luminous and lyrical book. Undaunted Courage is at once a tale of mythic proportions, a poignant human drama, and an essential piece of our history that allows the reader to be a silent and fascinated passenger on the fateful journey of Lewis and Clark." "Stephen Ambrose had combined his considerable taslents as an historian with his personal enthusiasm for the Lewis and Clark expedition to bring to life one of America's greatest-and most enigmatic-explorers. 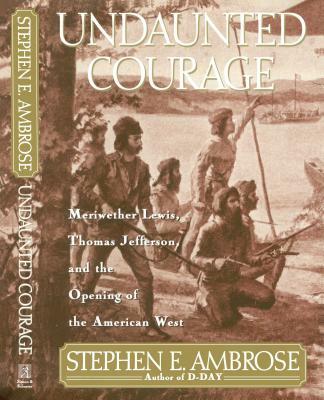 Undaunted Courage puts you in Meriwether Lewis's moccasins, all the way across the great American West."